Many marketers focus their promotion efforts around major holidays. But why stop collecting leads during the “slower” months? Take advantage of the quieter time of the year, and build lists that will come in handy all year round with a campaign that celebrates SPRING! 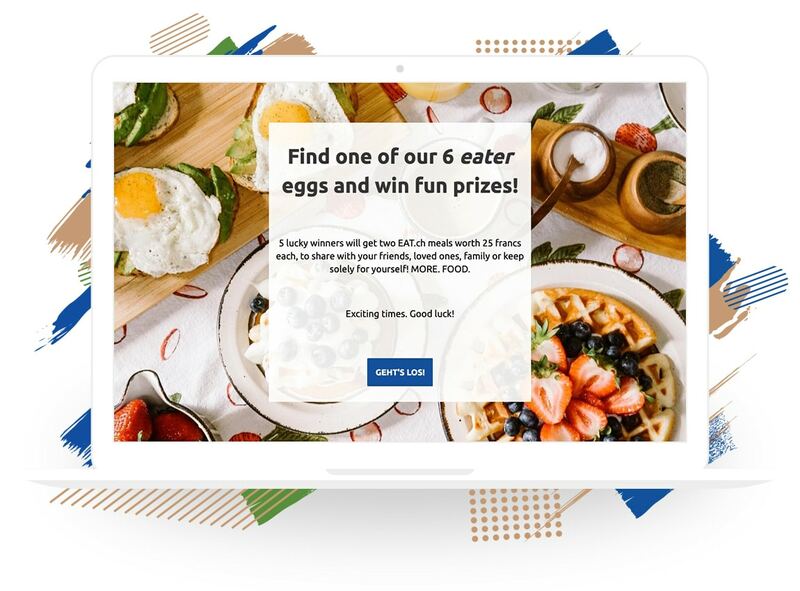 Below you will find six campaigns, along with helpful tips for setting up your own lead-generation contests and landing pages. Spring is the perfect time to host an outdoor photo contest. SLO Wine Lodging’s UGC photo contest was designed to delight, inspire and engage their followers. Participants must submit photos from the Edna Valley or Arroyo Grande Valley that fit the “50 Shades of Spring” experience. 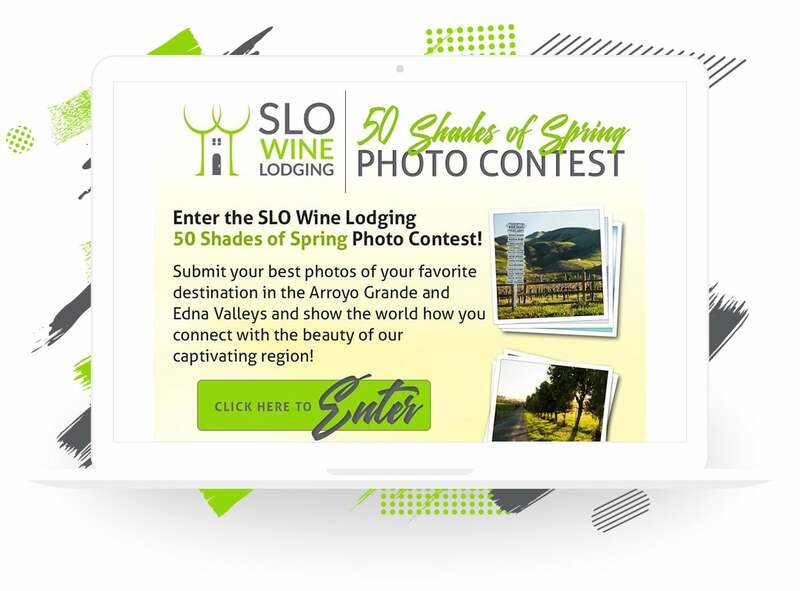 Entrants received an autoresponder reminding them to share and vote for their entry, and giving them the opportunity to book an SLO Wine Lodging vacation rental. THAT’S SMART: Even if your business isn’t a “destination” you can still require entrants to visit a specific location for their photos. Need some ideas? Ask for photos beside a specific item in your store, with food from your restaurant or with your sign in the background. After a long winter, folks are ready to get outside and enjoy spring. This time of year is perfect for a company like Blix Bikes, and they used the changing seasons as an opportunity to increase brand awareness for their electric bikes. 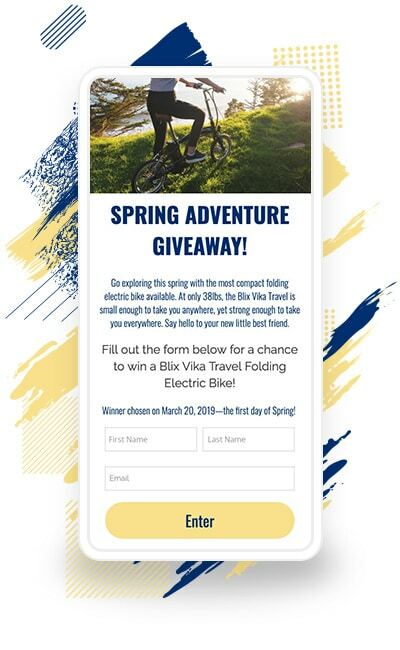 With the goal of helping someone get back to biking, they set up a giveaway for their Blix Vika Travel Folding Electric Bike. The giveaway is a perfect way to grow their email marketing leads and for future remarketing purposes during the warmer months! TIP: Blix Bikes used the refer-a-friend feature to encourage sharing. Each entrant received a unique referral URL that they were encouraged to share with friends. If someone clicked a referral URL and submitted their own entry, then the referrer was rewarded with bonus entries. Easter might not be a big “gifting” holiday, but you can have a little fun with your marketing! EAT.ch created an “Eater” (Easter) egg hunt campaign. Folks search an image on their campaign for one of six hidden eggs. Once they locate an egg, participants click on it to reveal a discount. To receive the discount, they must submit their information which also enters them into a drawing for an EAT.ch voucher. IDEA: Let entrants know if they won immediately after they submit an entry with our Instant Win feature. With this feature, you choose the entry time frame and how many prizes you wish to give away. ShortStack will reward prizes at random based on this information. Sweepstakes are the most simple campaign for growing your list. 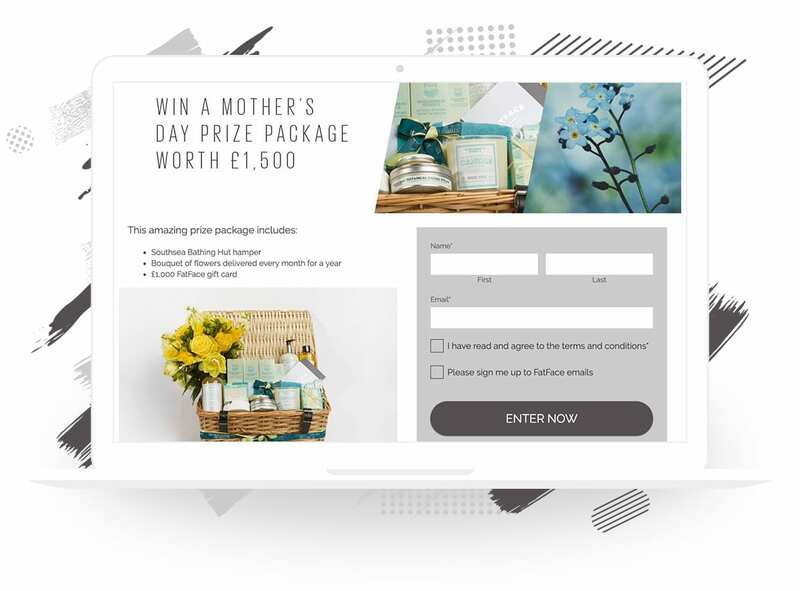 Mother’s Day campaigns, like FatFace’s sweepstakes, help collect valuable leads. By giving away a gift card to their store, FatFace knows the leads they are collecting are from people who are interested in their products for themselves or someone close to them, which increases the value of those leads. EMAIL MARKETING IDEA: Create a scheduled email with a discount for your business, and send it to all non-winners. Be sure to include popular products in the email for buyer inspiration. Photo contests don’t always require a voting portion. O’Toole’s Garden Center recognizes that their target market wants to be recognized for their hard work. 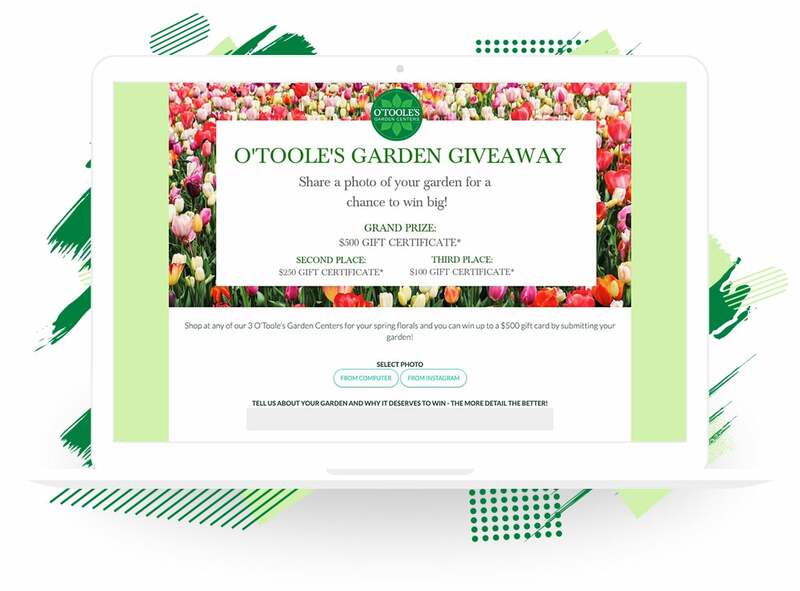 With the O’Toole’s Garden Giveaway, gardeners can submit a photo of their garden and a description of why they deserve to win the $500 O’Toole’s Garden Center gift card. Entries are showcased in a gallery on the page, but the winner is chosen by judges based on the creativity, beauty, and use of floral variety of their submission. TIP: UGC submitted by entrants can be showcased in your marketing! Share images, testimonials, etc on social media to engage fans. However, don’t forget to get permission first! Who doesn’t love a good Easter egg hunt? Like EAT.ch, Regatta is hosting an Easter egg hunt; however, their Easter egg hunt is a bit different. 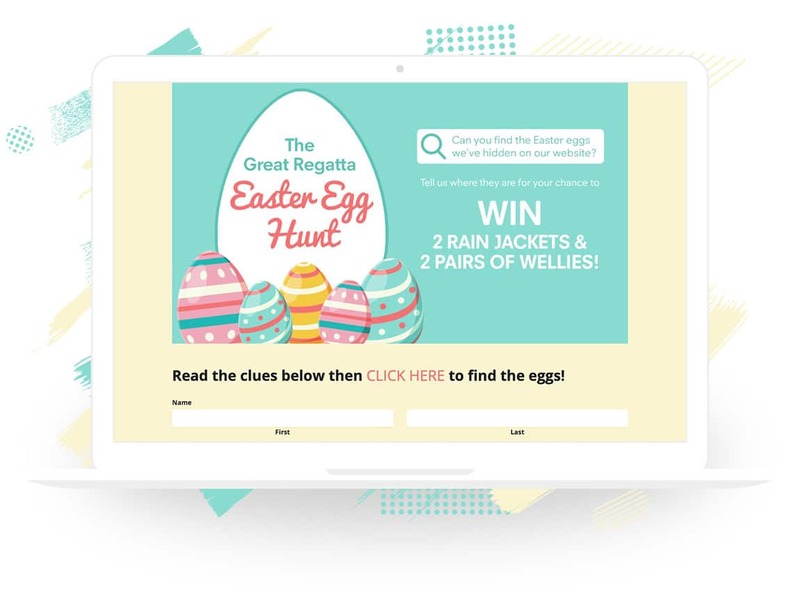 To participate, folks must visit Regatta’s website and locate the three hidden eggs. Regatta provided clues for entrants to help narrow the search. This is a smart way to direct customers to your website and encourage them to look around at your products. EMAIL MARKETING IDEA: Send an autoresponder after form submission with a discount code. Folks who have been searching your website will surely have found something they just can’t live without. Don’t wait for the next holiday to run a campaign. Instead, take advantage of the “off-season” to build your lists. These valuable leads will come in handy and help you break through the noise during busier times of the year. Looking for more ideas? Our blog is full of ‘em. Check it out! If you have any questions about these or other examples you have seen in our blog, just shoot us an email: theteam@shortstacklab.com.